What does fear of commitment mean? Can you get over your fear of commitment? (1) The type of people that are afraid of commitment because they still haven’t processed previous relationships that went bad. (2) The type of people that are afraid of commitment because they don’t want to give up their freedom. Giving up their freedom means becoming (more) responsible and (more) mature, and being stuck forever. Fear of commitment is their way to procrastinate the process of ˝growing up˝. Why do they procrastinate? Because they are afraid they can’t handle a relationship (and its responsibilities)… and that has everything to do with their self-esteem (regarding relationships). Both types have the same issues – they are afraid to commit themselves to someone or something -, use the same excuses: ‘I feel trapped’, ‘I am too busy’, ‘Lack of sexual variety’, ‘Is he/she the one?’, ‘First my career, then my love life’, and last but not least ‘Things are perfect the way they are now’, but they have different motives. On this page I discuss both types and I offer the couple tools to overcome fear of commitment. At Barends Psychology Practice guidance and treatment is being offered in regards to fear of commitment. Contact us to schedule a first and free of charge appointment. (Depending on your health insurance, sometimes treatment may be reimbursed). How to fix a relationship. Getting over a break up. Fear of commitment – Still dealing with the past. It’s devastating to throw yourself in a relationship for the full 100% only to find yourself heart broken in the end. Why would you risk burning yourself again in a future relationship? Why would you not just enjoy the fun stuff and stay away from the bad stuff (loving someone and risking another broken heart)? Even though these questions seem fair, the truth is you’re afraid of being rejected, and That’s why you keep running. You’re running away from your past and from the pain previous relationships caused you. No-one knows whether or not a relationship will last, but by throwing the towel even before the match has started, you’re throwing away something that could become very beautiful. Probably, in a previous relationship you’ve been vulnerable by opening yourself up to your partner. After a while the relationship ended. Perhaps your partner cheated on you or broke up with you. And because you were vulnerable you got hurt badly. So being vulnerable means you can get hurt badly. No-one likes the feeling of being hurt badly, so the easiest thing to do is to make sure you will never be vulnerable again. In most cases this means that you don’t talk about your true feelings, and you don’t talk (much or in-dept) about your past (relationships). On top of that you don’t allow yourself to develop strong feelings for your partner, because that means you’ll be vulnerable again. Is this fair to yourself and to your partner? I don’t think so. 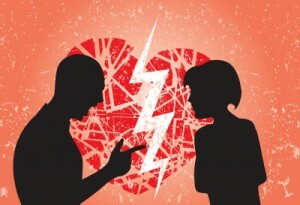 In the end, the pain from past relationships is negatively affecting your current relationship. In a way you are punishing yourself and your partner for something that happened in the past. So what can you do about it? The pain from your previous relationships prevents you from opening up to your current partner. It’s important for you to deal with that old pain. This means you have to face it. You have to face your pain and probably the fear that is accompanied by it. This is a difficult process. If you don’t do anything about your past, your fear of commitment becomes stronger and stronger over time. The first step involves talking about it to a professional and perhaps going for EMDR treatment (a very EMDR treatment effectiveness to deal with such experiences), or by talking to someone you really trust. The second step would be opening up to your current partner. It’s important to tell your partner about your situation and your difficulties. And perhaps even more importantly: ask your partner to be understanding and to give you time. The third step is to open up to your partner and experience how it is to be vulnerable. A success experience will balance that negative experience from the past. Make sure you don’t go all the way, all of a sudden, because it can hurt you badly if things go wrong. Fear of commitment – Not being able to give up your freedom. Perhaps it would be better to say: not being able to give up your current lifestyle. And that is exactly what’s going on. The first question that pops up is: “What would change when you commit yourself to your partner?”. People usually say: “Then I am stuck!”, “Then I can’t go out with my friends any more”, “Then I don’t have time for myself”, “Then I can’t get drunk any more” or “Then my partner wants to know about my whereabouts”. Are these the real reasons to stay single, or is there more to it? Could it be that you are afraid of committing, because you are afraid that you can’t handle the responsibilities of a relationship? And that you are afraid that your partner will break up with you eventually? This seems to be a much more realistic reason. All of a sudden it’s not so much about lifestyle but about having a low self-esteem (regarding relationships). The fear of giving up your current lifestyle is a common fear. Many people think that they have to change drastically, and that is scary. They usually compare their current lifestyle to that of people around them. The people around them may complain or have obligations the person with fear of commitment doesn’t have. So giving up your current lifestyle is bad, right? Wrong! Everybody complains about certain things in life. In fact, you complain about your current lifestyle as well. And you have obligations as well. If you start comparing, you usually do that to find evidence for your hypothesis: giving up my current lifestyle is bad. People will always find evidence for a hypothesis as long as they search for it. But it doesn’t mean it’s true. It only means: you ignored all the evidence that contradicts your hypothesis. The above mentioned excuses stem from the evidence your found for your hypothesis: changing your current lifestyle is bad. These excuses seem plausible and you can easily hide behind them. When 1 excuse is solved, you’ll come up with another excuse. In other words: it’s not so much about the excuses, but about your self-esteem. The fear that you can’t handle the responsibilities of a relationship can be paralysing. The fear that your partner thinks: ‘You can’t handle a relationship, I’ll walk!’ would only confirm your fear that you can’t handle a relationship. In other words: you will not even consider having a relationship, because that means you can’t fail either. If you would try and you would fail, you simply get the confirmation that you are not ready for relationships. If giving up your current lifestyle is your real fear, then it’s important to discuss this with your (potential) partner. Find out what it means when your partner or date wants to commit him or herself to you. Talk about the expectations and don’t forget to emphasize your desires and needs. Going all the way at once may not be the best idea. For some people it takes a while, and it’s a slow process. Turn your hypothesis upside down: search for evidence that is in favour of changing your lifestyle. You’ll see that the evidence is mounting. Now make a list with pro’s and cons and start comparing. When you find out that your excuses weren’t really the problem, then ask yourself the question: is it fear? After all, we’re talking about fear of commitment. But why are you afraid? Right, because you think you can’t handle the responsibility, and because you think your partner may break up with you. : Perhaps it’s a good idea to pretend that you guys are committed and live like that for a while. Pay attention to the details: what changes for you? If living together goes pretty well, then you guys can take a next step: talk about your fears. Does committing mean that you should have a baby together soon, that you should buy a house together, or a car? For some people this is an obstacle, because for them it means they are stuck, literally: there is no escape. Talk about these things, and respect each other’s opinion. If you guys have a different take on the future, then don’t forget to keep talking. By explaining what your motives are, how you see your future, you guys can grow closer. Communication is key. In case communication is difficult for you guys, consider talking to a therapist about this. A few sessions could be really helpful. For singles who are just dating: Don’t be afraid to get rejected once he or she gets to know you (or your family). So far things went well, and there is no reason to be afraid. The most important thing in a relationship is communication, honesty, and transparency. If you are afraid to open up to the person you’re dating with, then tell that person about your fear. This way your partner can support you by giving you space, time and by not being judgemental. Allow yourself to fall in love, and to enjoy the wonderful things a relationship brings you. At Barends Psychology Practice guidance and treatment is being offered in regards to fear of commitment. Contact me to schedule a first and free of charge appointment.